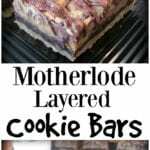 Sharing my Motherlode Layered Cookie Bars with you today! 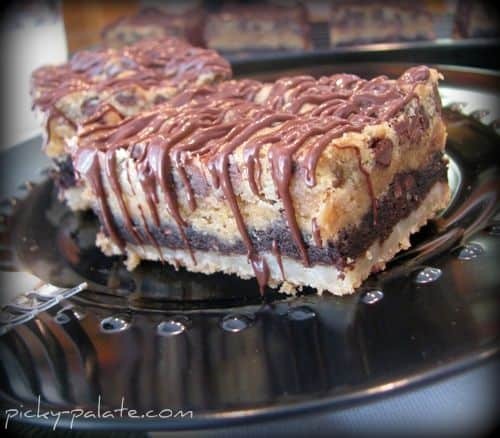 4 layers of your favorite cookie dough baked into a crazy delicious cookie bar. 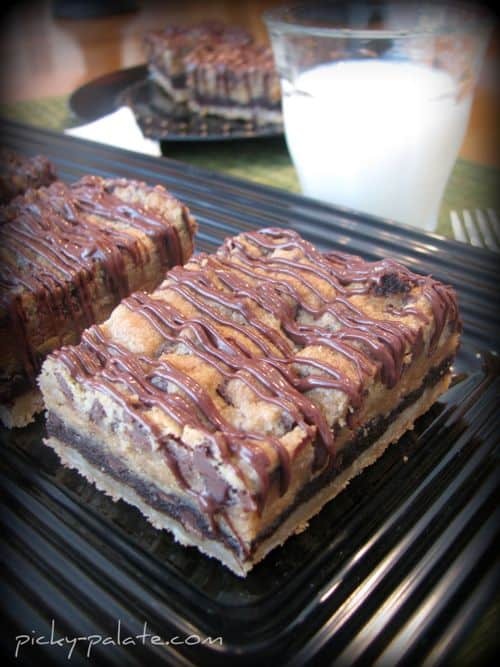 You are in for such a treat with The Motherlode Layered Cookie Bars! I know this cookie should absolutely be illegal, but let me tell you it is so much fun! Just imagine all of your favorite cookies layered into one bar of fabulousness! Now, don’t go and eat this on a regular basis, but do bring it to your next party or gathering and watch them disappear! At first glance it may look like a lot to prepare, but each cookie dough can be made in under 10 minutes, so don’t be turned off by the steps below. I like to make the cookie dough in advance and have it in the refrigerator ready to go. For other Picky Palate cookie recipes click HERE. 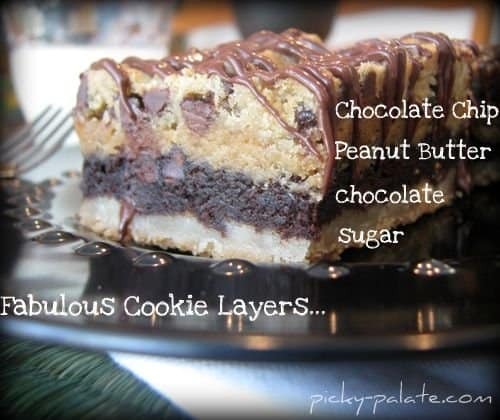 See the picture below for all the incredible cookie layers. Preheat oven to 350 degrees F. Press sugar cookie dough into bottom of a 9x13 inch baking dish that's been lined foil and sprayed with cooking spray. In a large bowl cream together the butter and sugars until light and fluffy. Slowly add eggs and vanilla until well combined. In another bowl combine the flour, cocoa, baking soda and salt. Slowly add to wet ingredients then stir in chips. Layer 1/2 the recipe over sugar cookie layer, pressing gently. Place all ingredients into a bowl and mix until combined. Press over chocolate cookie dough. Preheat oven to 350 degrees F. For Sugar Cookie Dough Layer: Press sugar cookie dough into bottom of a 9x13 inch baking dish that's been lined foil and sprayed with cooking spray. For Double Chocolate Cookie Dough Layer: In a large bowl, cream together the butter and sugars until light and fluffy. Slowly add eggs and vanilla until well combined. In another bowl, combine the flour, cocoa, baking soda and salt. Slowly add to wet ingredients then stir in chips. Layer 1/2 the recipe over sugar cookie layer, pressing gently. For Peanut Butter Cookie Dough Layer: Place all ingredients into a bowl and mix until combined. Press over chocolate cookie dough. For Chocolate Chip Cookie Dough Layer: In a stand or electric mixer cream the butter and sugars until well combined. Beat in eggs and vanilla until combined. Place flour, baking soda and salt into a large bolw; mix to combine. Slowly add to wet ingredients along with chocolate chips. Spoon 1/2 of the dough evenly over peanut butter cookie dough but don't press, just leave uneven. Bake for 35-45 minutes or until center of dough is cooked mostly through. Edges will be brown. I covered pan with foil during the last 15 minutes of baking. Let cookies cool completely. Lift out of pan with edges of foil. I cut off 1/2 inch edges and just used softer centers, but do as you wish. Edges are crispier. Drizzle top with 1/2 Cup melted chocolate chips if desired. OMG!!!! Another recipe I need to try NOW. Hopefully, this weekend! so good!! you could even make this with all pre-made dough if you’re in a pinch! That loos outrageous! Oh. My. Goodness. Those look fantastic! I attempted something similar, but with mixed results because of my softer brownie and cheesecake layers. The cookie dough idea is fabulous 🙂 Might have to give it a try. Lurker here….but had to come out of Lurkerville to comment. One word WOW!!!! I can not wait to make these. You are SUCH a good writer and cook. I really enjoy your site. Oh my! Are you kidding…these look amazing! I love the idea of combining them all together! Oh my those are rich! Love the layers! These look delicious and absolutely sinful! Can’t wait to try. All I can is Oh My…. Gotta try this one. I totally agree…these should be illegal. Can’t wait to try them, though! You are incredible! Looks WILDLY delicious. Those look like they would put 2 lbs on for one bite!!! I can’t wait to make one! So unfair. Totally, absolutely, definitely unfair. My diet has no chance at all, looking at something like this! Put me in a sugar coma. They look good. 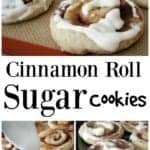 I am totally in love with this webpage…I have printed out about 50 recipes so far and can’t wait to start baking. I do have a question in regards to “Mother Load Layered Cookie Bars” What do you mean by “Only Make 1/2 of this recipe” for layer 2 & layer 4? Do you mean to cut the recipe in half e.g if it calls for two sticks of butter then use only one? Or do you mean after combining all ingredients to use only half of that? I’d hate to mess up such a fantastic dessert. Thanks for visiting and hope you enjoy the recipes!! Yes, if it calls for 2 sticks of butter, just use 1 etc. You can make the whole recipe if you’d like and just use half of it if you’d like too. The leftovers make great cookies. Hope you enjoy!! Oh my goodness! Those look like my idea of cookie heaven! Are you kidding me? This looks incredible! I have got to make this! I am fairly new to your site, and I have only one thing to say. You are a baaaad woman!!!!! These should be illegal-they look way too good!! I’ll definitely be making these soon. WOW! What a fantastic idea… keeps the kids from arguing about what kind of cookies to make and the finished product looks so cool. Will definitely try these! Thanks for the inspiration. your recipe left out the temperature to bake the marvelous creation at. I am guessing somewhere around 350°F? Hey josh- she DID say what temp to cook it at, after the choco chip recipe, and yes it is 350F. Great guesstamite! These look scrumptious! My 4 year old just walked back and said Ohhhh Can you make that?!?! So, on the menu it will go! I am actualy going to make these this weekend for my son’s birthday, with one small exception. 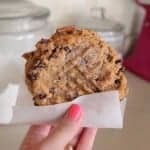 I am going to make the full recipies for the cookie doughs and just make cookies too, no use in fighting it I am going to bake them anyhow so I may as well do it while making these bars! Great recepie looks fantastic! Those cookie bars look oh so decadent and fairly easy for a non baker such as myself. Thank you so much for sharing. Bookmarked! I’ve also added you to my search engine!!! You are brilliant!! ….and evil!! Quick Question? !- What does “Only make 1/2 of thie recipe” mean? I’m going to have to make this!!! My thighs hate you…I love you, though. These must be incredible! OH MY!!!! These things look incredible! I will now be on a mission to make these asap. Thanks for sharing! Those are insane!!!!! I am drooling. I want one with a big glass of milk, please!!! That looks amazing and I am pregnant. Guess what tonights activity with the kids will be! Ok, really, how are you ever gonna top this??!!!!!! I thought the peanut butter cup cake was the answer to my prayers…but this cookie….OMMMMMMMMGGGGGGGG!!!!!! WHOA! They sound sinful but look oh so good. I love how perfect all the layers are. Holy moley, yer killin’ me, Smalls!! a friend twittered this page tonight as I was getting ready to make something for our staff meeting tomorrow, so I tried it. Nice thing is, it looks complicated but it’s made with stuff any one would already have around the house. It’s in the fridge ready to be popped in the oven in the morning – can’t wait to see how it tastes. Oh, and the extra dough is in the freeze for when I need a quick dessert! Thanks for the inspiration tonight. No kidding, those do look like the mother load! Are they time consuming to make? Jenny said that it takes 10 min. to make each dough, then cook for 35-45 min., so around 80 min. altogether. Awww man those should be illegal! They look amazing. I can’t wait to try them! That may be the best dessert I’ve ever seen! I love love love cookies. What could get better than this? ?